An interesting comparison of the iPad to the Kindle with respect to accidental button pressing reminded me to share some observations and a link about the “naturalness” of multitouch gestures. I let Tobias hold my iPod touch occasionally. He’s at the age where flipping it back to front and back is plenty fun and his curiosity is mostly towards how it might taste. He’s not very interested in interacting with it, but I think he could be if it were a little closer to his normal experience. 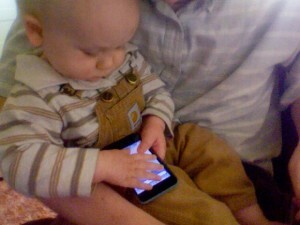 Of course, with the glass screen he feels no relevant tactile feedback. So there’s a significant abstraction right up front. Furthermore, since my iPod is the first model, it doesn’t have a speaker for regular apps to use. So he rarely hears audio feedback. But the issue that I noticed most is that, typically, he doesn’t even get to see any visual feedback. The touch gesture he is paying attention to simply doesn’t work. Since Tobias can’t “palm” the iPod (he just turned ten months old) he’s typically got one thumb smeared across the screen just to hold it. In this situation, most software just ignores the actual touching of his free hand [okay, it's more like slapping, but...]. Software that does handle multitouch often fills its corners with hot areas that activate settings instead, which is even less interesting than interface he might otherwise start figuring out. I don’t entirely fault the software; most of it is designed well for adults or at least children who can talk and follow verbal instructions. It’s just been food for thought, making me even more embarrassed that Sesamouse (my utility for enabling real multitouch gestures on the desktop via a Magic Mouse) doesn’t even recognize gestures when they start in the top part of the mouse. Multitouch is still a new field to most developers, and gesture recognition is not without challenge. I suspect that as more designers and more programmers are given more time to use and think about handling multiple fingers through multiple frames, multitouch software will become more sophisticated. Not in the “draw a squiggle with your index finger while tapping your pinky up and down” sense (as even many simpler gestures are neither intuitive nor discoverable) but in the “it just works” sense.